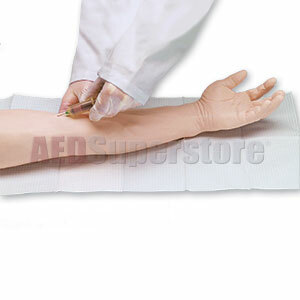 Realistic arm for intramuscular and intradermal IV therapy and phlebotomy training. The Life/form® Advanced Injection Arm Simulator Light Skin by Life/form replicates the human arm for training intramuscular and intradermal IV therapy and phlebotomy. As close to real as the present technology can get, this device simulates the entire arm from shoulder to fingertips. Students can develop the necessary manipulation skills for locating and palpating the veins and learn the various primary and secondary venipuncture site locations. The training arm's skin and veins are all completely replaceable, and under normal use should provide practice for hundreds of injections. The Simulator package includes the training arm, 2 pints of simulated blood, 3cc syringe, 12cc syringe, needle, 2 fluid bags, instruction manual, and carrying case. Five-year manufacturer's warranty.